Each year the tidal Thames is allowed to rise and fall naturally between Richmond and Teddington locks, so that the Port of London Authority can carry out essential maintenance on those locks and other infrastructure such as the weirs and sluices. The extremely low tide this creates gives an opportunity to enjoy rare views of the Thames. This year the draw-off will happen in the three weeks between 29th October and 19th November. In 2015 I went to see this with some friends, in fact we ended up walking from Richmond to Chiswick Strand via Isleworth and Brentford and it was a great day out*. 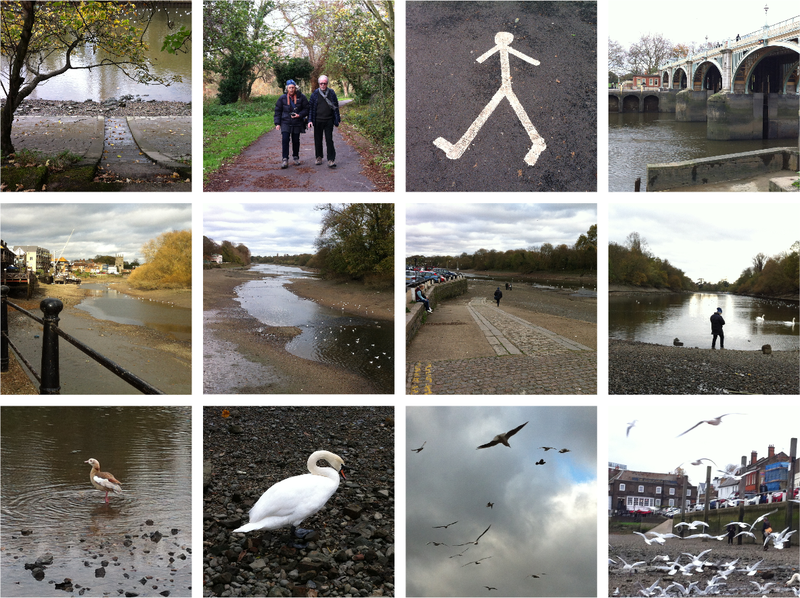 The low tide effect was especially good at Isleworth, as shown in the last eight pics, where we gained access to the river at the boat ramp (or whatever it's called) and saw one of those special foreign geese in amongst the regular ones (bottom left). It was really strange and special to be standing almost in the middle of a river. It's also a good opportunity for a tidy up and local people and environmental groups gather to clear the river of harmful plastic and other litter. *Except for trying to find Gunnersbury Station at the end – this must be the most well-hidden, hardest-to-access station in London... unless you can think of other contenders for that crown...?